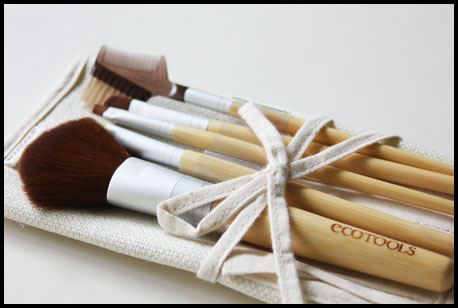 I've always been pretty fascinated with EcoTools brushes. I purchased a set online a few years ago without knowing what EcoTools was, and was very impressed with the results I got from using them. I received this brush set from the EcoTools PR and, as expected, they performed brilliantly. In the brush set is a blush brush, eye shading brush, angled eyeliner brush, concealer brush, and a lash & brow groomer. As a little background, EcoTools, as the name suggests, is an eco-friendly company. The brand takes pride in manufacturing environmentally friendly products, including cosmetic accessories, and bath products. The brushes are highly durable, easy to wash, and last forever. The bristles are also mind-blowingly soft - something that surprises me every single time I pick up a brush. I love the blush brush, angled eyeliner brush, and lash & brow groomer. They all perform very well, and not a single hair has shred from these brushes so far. I haven't quite gotten on board with the brushes which need to pack on product - I find that they don't pack enough product, whether I am using them for concealing or for applying eyeshadow to the lid.